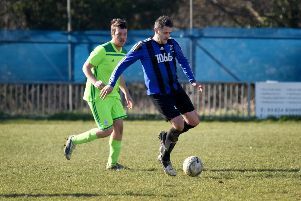 Hastings United Football Club forward Davide Rodari plans to return to his native Italy to undergo surgery on his ruptured anterior cruciate ligament. Last season’s 17-goal leading scorer discovered he had suffered the serious knee injury two weeks ago and Hastings manager Chris Agutter expects to be without him for 8-12 months. In a social media post, Rodari wrote: “As most of you know I haven’t been playing football recently due to an injury. “Unfortunately I found out in the past weeks that it was a lot worse than I thought. I didn’t say straight away as I was devastated about it and I was told that I will probably stay out all the season so I was in the worst mood possible. “With this I have decided to go back to Italy and do the surgery over there, and do the rehab in Switzerland for 4-5 months so I can stay close to my family which will help me even more to stay focused. “I’ll do everything possible to come back stronger than ever ready to achieve my dream and scoring goals. Hastings will visit Southern Combination League Premier Division neighbours Eastbourne Town in their penultimate pre-season friendly tonight (Tuesday). Kick-off at The Saffrons is 7.45pm. Bostik League South East Division club Hastings drew 1-1 away to Bostik League Premier Division newcomers Walton Casuals in very windy conditions on Saturday. Hastings’ final friendly is at home to Bostik Premier club Whitehawk next Monday, kick-off 7.45pm. * Budding sports journalists are reminded that applications for the Hastings United FC Sports Writer of the Year Award (18+) and the Hastings United FC Junior Sports Journalist of the Year Award (under 18) should be made by today (Tuesday). More information is available at www.HastingsLitFest.org. The winners of all competitions will be announced on September 2 at the Royal Victoria Hotel, where actor Amanda Burton will be presenting prizes.